Malaysian government officials directly lobbied UK ministers on an EU move to phase out palm oil from biofuels as they looked to “test post-Brexit approaches”, according to a diplomatic telegram obtained by Unearthed. The news comes after EU lawmakers agreed a deal in the early hours of Thursday morning to phase out palm oil from biofuels in Europe by 2030. The move, which is part of negotiations around the EU renewable energy policy was agreed by figures from the European Parliament and EU member states. 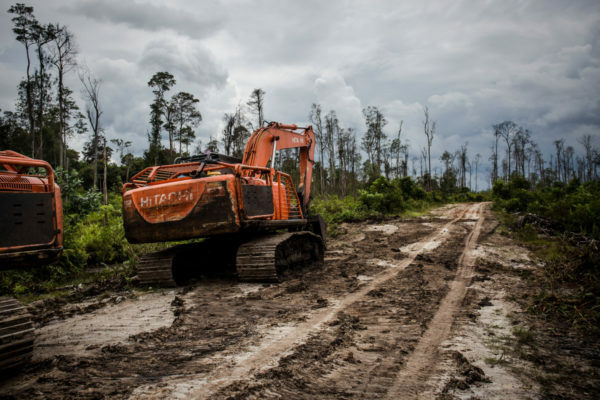 It is likely to anger the world’s two main palm oil producers, Malaysia and Indonesia. For the past few months, EU figures have looked to include a ban on palm oil in biofuels counting towards renewable targets, as part of negotiations around the new renewable energy directive. Under the new plans, restrictions will also be placed soybean oil biofuels, as reported by Euractiv. This comes after officials from Malaysia and Indonesia claimed that palm oil was being unfairly singled out by decision makers. Both Malaysia and Indonesia have promised to strike back against EU member states, if the palm oil phase out becomes law. A diplomatic telegram sent by officials in Kuala Lumpur on February 2 and obtained by Unearthed using freedom of information rules states that the Malaysian government is “strongly opposed to the ban and is drawing up proposals for “reciprocal trade sanctions”. The key section from the diplomatic telegram. Asked to comment on this story, a spokesman for the Department for Business, Energy and Industrial Strategy was “looking carefully at the EU’s proposed renewable targets”. But declined an opportunity to clarify the government’s position on the palm oil issue. Despite the UK’s decision to leave the EU, the UK is still part of negotiations around the directive. International trade minister Liam Fox has repeatedly talked up a trade deal with emerging economies in south-east Asia after Brexit. In a speech last year, Fox told an audience in Kuala Lumpur: “As the UK leaves the European Union, we have an unprecedented opportunity to work with our partners across the world to drive prosperity, champion free trade, and deliver a better future for all our citizens. Malaysia, and Malaysian companies, are our partners on this journey. Mah Siew Keong, Malaysian plantation industries and commodities minister, wrote in an opinion piece in the Telegraph in November, that Brexit could be an opportunity for a new relationship between Malaysia and the UK, free from “strong vested interests in Europe” which have “pushed for a more protectionist approach in dealing with palm oil”. 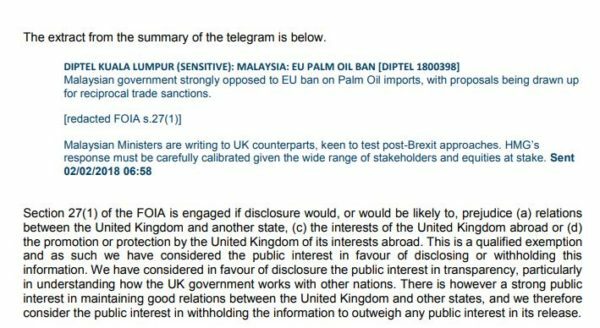 Unearthed reported in May that British diplomats warned the government that the EU palm oil ban could affect a major defence deal with Malaysia. BAE Systems has long tried to secure a multi-billion pound deal to sell Typhoon fighter jets to Malaysia. But faces competition from the French made Rafale jet. Correspondence obtained under FOI showed that on the morning of 5 February, an official at the British high commission in Malaysia sent an email warning that the EU decision was “a big issue for Malaysia and, if not handled correctly, has the potential to impact on bilateral trade, particularly defence sales (Typhoon)”. Email correspondence from that time between the Ministry of Defence, the Department for Environment, Food and Rural Affairs, and the British high commission in Malaysia also revealed that former Malaysian Prime Minister Najib Razak was expected to lobby Theresa May personally on the issue at last month’s Commonwealth Heads of Government meeting. But in the end Razak did not attend the meeting in London. The government has previously declined to respond directly to Unearthed requests, submitted to several departments, on whether any minister had been lobbied directly by Malaysian representatives on the palm oil issue. The palm oil industry has exploded over the last 20 years and the vegetable oil can now be found in everything from chocolate bars to fuel. But the commodity has also become synonymous with deforestation and environmental damage in this time; notably to orangutan habitats. Palm oil has not been used in transport in the UK for several years, though it is used in biofuels in other European countries.